The efficient operation of the AQUASYS fire fighting system was successfully demonstrated on Tuesday, 29 January 2019. In the afternoon a car transporter in the area of the rear axle started to burn in the Arlberg tunnel (Austria). The fire subsequently spread to one of the eight charged cars (video). 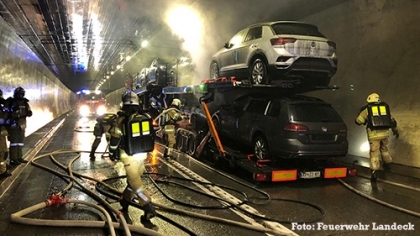 The AQUASYS high pressure water mist system installed in the Arlberg tunnel triggered immediately and limited the resulting fire to a small area in the trailer of the truck. 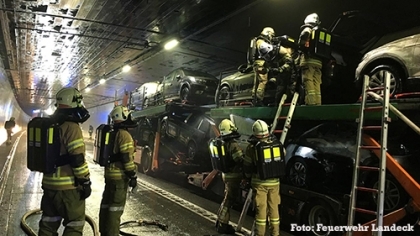 In this way, the AQUASYS fire-fighting system prevented the fire from spreading to other charged vehicles and cars left behind in the tunnel, thus damaging the tunnel infrastructure. Within half an hour the fire was completely extinguished by the support of the fire brigade and the tunnel could be reopened to traffic after a few hours. The managing director of ASFINAG made the following statement in the press: "Today's incident has shown that all the tunnel's safety equipment has worked 100 percent. This applies primarily to the automatic high-pressure mist spray system, which prevented excessive heat generation." A comparison of tunnel fires with or without a fire-fighting system, such as the truck fire in the Gleinalm tunnel in autumn 2018, shows how important efficient fire-fighting is: there was a high level of property damage and the tunnel had to be extensively renovated after the fire and closed for three months!